A new study in the journal PLoS ONE examines the damage to the connections between the networks in Gage's brain, finding that this probably contributed to Gage's documented behavioral changes. Researchers compared information about Gage's skull to magnetic resonance imaging (MRI) scans of the brains of 110 right-handed men between ages 25 to 36, the age range at which Gage lived with his injury. 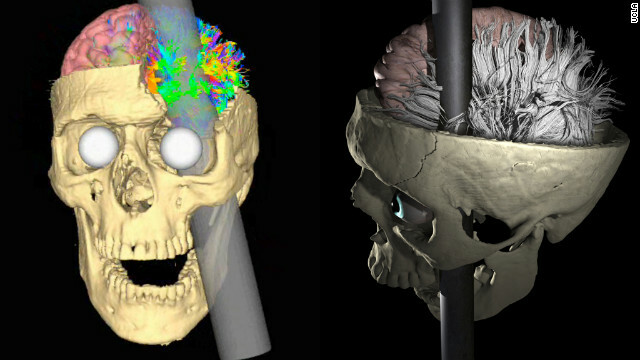 In this way, they simulated the trek of the rod through Gage's skull and assessed damage to cortical gray matter (found in memory regions among others) and white matter (which has been implicated in learning and cognition). "If the rod had penetrated his brain at any other angle, even slightly different than the trajectory that it took, it might have pierced some major cerebrovasculature, and taken his life," said the study's lead author Jack Van Horn, assistant professor in the department of neurology at UCLA School of Medicine in Los Angeles. Researchers concluded that while the rod intersected with about 4% of the cortex, the accident damaged 11% of white matter. That means that the damage wasn't localized to the part of the brain the rod traversed and the gray matter within. Instead, the connectivity between many important regions of the brain broke down. The patterns of damage they found is not much different from what's seen in Alzheimer's disease, frontotemporal dementia and traumatic brain injuries. Mapping strategies like this would be important for measuring the degree of damage that people with traumatic brain injuries experience, Van Horn said. They reveal the effect of the damage on the network connectivity of the brain and the properties of the networks. This could have implications for assessment, monitoring and treatment opportunities for patients. Over 1 million people sustain a traumatic brain injury every year in the United States, but perhaps no one is as historically famous for surviving one as Gage. "Hopefully this kind of thing helps us to understand a little more about what he went through, about what his brain injury meant, and how, by understanding that, it might be helpful for modern day traumatic brain injury and degenerative disease patients," Van Horn said. Gage's skull is currently on display at the Warren Anatomical Museum at Harvard University. I had a 1/4 inch long wood splinter in my foot for 10 minutes once. Funny that that managed to damage your thinking, too. I put a 8 inch rod in your wifes mouth. You measured it by placing the splinter next to your d1ck and it matched perfectly. i guess that took the thunder out of you. Thunder: Based on your post, sounds like you too have a 43 " iron rod through your skull. My son has a TBI brain sheer injury and the part of the brain that controls your body temp. never healed so he is always cold we live in Goodyear Az. and it gets hot here but he still remains cold i wondered if an injection of cortisol would help, any one know about this drug and it's effect on this part of the brain? I don't think this is where you want to gain medical advice. Have you read these responses? You want to get medical advice here? Talk to your sons doctors- the Internet is full of crap and you cannot replace a doctors knowledge. Wrong place to ask that, dude. Asking people here for medical advice is like asking a murderous psycho how to help with anger management. Diana, you can check out center for neuro skills online they have a section called "brain injury news" maybe it would help. Also i'm sure your state has a brain injury association. Just google these. I think looking into alternative meds is a good idea. If this temperature control is the only problem your son has subsequent his injury he is very fortunate, however I still hope you find the answers that you are looking for. Not sure why this is news worthy since it has already been reported. Shouldn't the writer link it to something that is current instead of hinting? Reports need to learn to "report" the news, and not give their opinions. That's what's wrong with reporters now a days. "Not sure why this is news worthy since it has already been reported. " If you had actually read the article, the "new" part isn't Gage getting a crowbar to the head, but a new study attempting to recreate the damage. Also, this is a blog, not news. Hello friends, the news is the study that I mentioned in this article, which further investigates the damage that Gage sustained. Also, "The Chart" is a health news feed for CNN.com. You can be assured that you will find news here. Have to love these classic cases in Neurology. And there's a song about it! DFTBA! You know bud. I know this from experience. I commented a few steps down from you. He probably acted out a bit because the people around him thought he was retarded or something. There are a good number of people with similar injuries that are very intelligent, who get tired of being treated like a dunce when they are obviously very intelligent. The behavioural problems more than likely stemmed from some kind of longing to get some kind of revenge for the way they'd treated him before the injury as well as being very angry about the way they were currently treating him. When you have a serious illness and the doctors don't even take it seriously, it will make you very angry. You may not want to physically cause harm to them, but it can be tempting. It's also tempting when you are being treated that way to tell other people things that may stir up conflict, after you have walked away, in hopes that someone with a better frame of mind will handle the situation more gracefully because it can definitely be very nerve racking. My injury was left frontal also. Have a good weekend and God bless. I wanted to read about the behavior changes, which were not in this article, so I went to wikipedia. I was very troubled to see that the author of this article seems to have shortened and reworded the first few paragraphs from wikipedia, and not bothered with the behavioral stuff. You wanted to learn more about this so you went to Wikipedia? Not exactly my first stop when researching anything let alone a traumatic brain injury. I'd suggest searching through online medical journals if you want to find out about brain injuries and the behavioral changes that result. Anyone can post anything on a Wiki. No credentials needed there. I don't recall what it was like not to have a left frontal lobe injury, but I can tell you a couple of things. People with these types of injuries can be agressive when they feel their lives are in jeopardy and people are trying to pull a fast one on them. We often have great personalities and can be very polite, until buttons are pushed. Too much medication is a very bad thing. Not to dehumanize myself or anyone else, but when you find an old coin that is tarnished, you don't want to scrub it the wrong way or put too many chemicals on it. It will deface the valuable parts of what has not been destroyed by the normal whethering. In most cases, people like me lose a bit of their edge when you try to treat their problem with too many mood altering drugs. It destroys the personality, and could possibly turn you into a stone cold serial killer. So psychiatrsts should be very very careful about prescribing these medications to people in these situations. No, I've never axe murdered anyone, but I know from experience that meds often make you much more dull. Drinking too much is never the best idea and other drugs are definitely a no no. I doubt Skeptical is expecting to do brain surgery tomorrow. Wikipedia is fine for layman information grazing. In my experience, accuracy is proportional to topic obscurity – you don't see a lot of vandalism on organic chemistry articles, for instance. Not one shred of new information here. The case was dramatized on a PBS show, "The Brain" over 20 years ago. You should try actually reading the article next time. There is a newly published study that investigates the regions of the brain that were affected, and how it may have led to his condition. He died in the 1800s, almost 12 years after this injury. Thanks for reading! I have a psych degree and have read about this case many times. They always bring it up when discussing the functions of different areas of the brain–in this case, the frontal lobe. This case is often cited when they explain that the frontal lobe is responsible for personality. I don't hav ea psych degree, but how is yours helping you as you make cofee at Starbucks? Tragic accidents like Gage's won't stop until we finally ban the manufacture and use of 43" iron bars. Much safer 44" iron bars have been available for years now, but industries refuse to upgrade for cost reasons. Looks like many more people will have to get a metal rod blown through their brain before there will be enough support for new legislation. The problem is that there has been no fact finding committee appointed which can propose new regulations. Where is big government when you need it? My company has a policy to paint all 43" bars florecent orange. We haven't had a single case of "Metal Head" since the policiy was inplimented. You research is flawed and politically biased. Theses enough evidence to support that 42" iron bars would do far less damage. Legislation would only serve to make lawyers rich. The important thing about this article to me is that it shows us that human behavior is brain behavior. Change the brain, change the person. The 'soul' is nowhere to be found. That isn't news to science. The "soul" has always been an abstract fantasy created by humans. I once killed a gopher with a stick. I have an injury to the left frontal lobe from when I was child, and I can tell you one thing about Pheneus Gauge some people probably don't know, the more you treat someone like us as less than the more we will most definitely act out, whether it's for the best or not. I figured out a long time ago that if no one wants to treat you like a human, you will more than likely be better off away from the "civilized" members of society, alone to study. Yet, when the world around you seems to have forgotten about you, that will make you even more upset and possibly angry after a long period of time. The funny thing about it is that if you see someone with a scar on the left side of their head, and you try to pull a fast one on them, I'd be careful about thinking you even fooled them at all. There is so much crime, and I think a lot of it has to do with our dehumanization and the decay of our moral framework. Adios. Am amazed that no one tried to make this Obama's fault, or blame it on Bush. A rod shot through the skull of someone over 100 years ago is the only thing on earth that isn't partisan! What makes you think its not? 43inch rod vs mans head. That sounds partisan to me. I just finished reading "Not Afraid of Life" by Bristol Palin for about the sixth time. It is thoughtfully written, relevant and riveting all at the same time. Such a bright young woman! We can all learn from her. (I bought 10 copies and passed them out to friends). Over 1 million people sustain a traumatic brain injury every year and 999,999 of them post on CNN. Whats the other one doing? Oh, I know. Writing the story. The one not posting on CNN recovered. Over 1 million people sustain a traumatic brain injury every year in the United States. Is this real or is it like putting the "F" word in a movie more than 35 times so you can get that R rating rather than PG? We all know that 46.3% of all statistics are made up anyway. That is one lucky man. No one would of survived that. Just pure luck that is all there is to. Frontal lobotomy while tapping gunpowder into the ground; you're doing it right. Is this where the term "nimrod" comes from. I await to embrace your flaming. That is correct! A Nimrod is a person with limited brain function due to an injury from a metal rod. Now go share this insight with family and friends. Next time I have a brain frt, I am going to blame it on old sports injuries. Brain injuries are among the reasons to ban contact sports in schools. Making children do things that can cause them harm is called child abuse. Thanks for the information you provide is very helpful .. This is not the place for fantasy. We were the first research team to create a model of what Gage's brain would have looked like based on ~100 male subjects of the same age. We were the first team to calculate the trajectory of the rod through his head. We were not the first team to describe the damage to his cortex (even the doctor on the scene at the time poked his fingers inside the skull and roughly described what he found), but we are the first researchers to look at what connections between brain areas was damaged. This means that not only have we isolated what functions may have been impaired, but we also looked at how his brain's internal communication would have changed. Hope this answers some questions. Also, the research attempts to dispel many of the rumors brought up in these comments, such as the idea that his personality drastically changed. The information we have about his life suggests that the way that others treated him changed, but that he himself was still very functional and, contrary to popular opinion, maintained steady employment until his death. He also traveled extensively (and possibly by himself) to Massachusetts, Chile, and California. He was probably not angry and anti-social about his accident, as folklore claims. It is known that he kept the tamping iron with him wherever he traveled and took great pride in his unique story.